Cleaning up the collisions between technology and human nature. Boston University School of Medicine researchers say children under age two-and-a-half “cannot learn from television and videos as they do from real-life interactions,” so using a mobile device can be “detrimental to the social-emotional development of the child” and hamper the kiddo’s ability to develop either practical problem-solving skills or human empathy. Any screen time has been linked to sleep disruption in preschool-aged children, and television viewing has been linked to delayed language development among very small children. The American Academy of Pediatrics has been quite forthcoming with their screen time recommendations for the wee ones too: No screen time whatsoever for children under age 2, no TV screens in any child’s room, and be present for any electronic entertainment consumption. Yet for all the alarms ringing about our feral children’s brains running out of their ears the minute they look at an iPad…kids are looking at screens early and often. 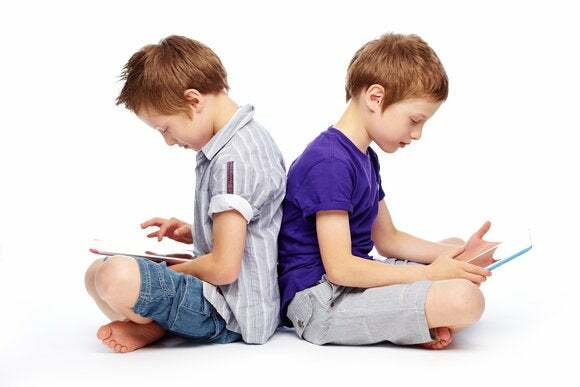 According to Common Sense Media, 39 percent of all 2- to 4-year-olds are using some sort of touchscreen mobile device at home, while the American Academy of Pediatrics Council on Communication and Media found that 90 percent of children under age 2 are viewing electronic media. These kids aren’t exactly breaking out of the crib to get their fix: a Nielsen survey found that 80 percent of parents are handing off their tablets to their kids, while 75 percent of survey respondents at Babyshower.com admitted to handing off their smartphones to their small children. Screen time can be just another thing your family does together. I’m no exception. My daughter was manhandling (or toddlerhandling) my iPhone before she was 1: We were stuck at an event one afternoon, and three playground explorations, two walks, and three circuits of a tech show floor had failed to keep her amused. I pulled out my phone and played a series of music videos on the Signing Time app, and for 20 minutes, there was peace in the kingdom. The whole time I was doing it, I knew there was probably a member of the AAP who was feeling a disturbance in the Force. And yet… Given a choice between singing along with the videos while I snuggled my daughter or strapping a cranky baby into the stroller for another walk neither one of us would enjoy, I went with the experience that gave us both pleasure. What time of the day is it? I noticed early on that giving the kiddo screen time on weekend mornings made her impatient and demanding until naptime. We joked about “screen poisoning.” Now, my daughter doesn’t get screen time unless it’s mid-afternoon or early evening and we can work the toxicity out of her system with a mother-daughter coloring session or some reading together. I avoid any screen time for an hour before bed. Are we at the table together? We do have a no-smartphones policy at all family meals, and “family meal” is defined as any snack or meal where the kiddo is with at least one other parent. Learning how to read people is an important skill; she can choose to be the boor who spends an entire meal staring at her smartphone screen once she’s grown up and moved out of my house. What kind of screen time is it? There’s a big difference between the apps that encourage pattern recognition or offer some interactive, creative play (like Don’t Let the Pigeon Run This App) versus the ones that basically reward a kid for clicking on a teddy bear as a narrator plows ahead in a story. And there’s a big difference between any app and noninteractive videos played on a mobile device or TV. I’m more likely to let the screen time tick up to 20–30 minutes if the kiddo’s tootling around Toca Lab than if we’re watching the “Think Pink” number from Funny Face for the fourth time in a row. How much screen time has my child had this week? My daughter and I have a girls’ night every Tuesday: a shared pineapple-pepperoni pizza and two episodes of Sofia the First on Netflix. Because that’s 40 minutes of passive entertainment, I make sure she has no screen time at all on Mondays or Wednesdays. I try to look at screen time in the aggregate: if we can keep her averaging at or below 30 minutes per day every week, that’s a win in my book. Will a parent be around? We don’t allow unsupervised screen time, and we are not above pausing a Sofia the First episode to talk about something that twigs our parental radar. We also keep a close eye on how our child is interacting with a game—is this the kind of thing where her imagination will grab the fodder and run, or is this app very limited in what it allows a child to explore? This is a new way to do family time, and it has helped me examine my adult relationship to technology as entertainment. She can choose to be the boor who spends an entire meal staring at her smartphone screen once she’s grown up and moved out of my house. All these questions circle around a few core ideas: Knowing your child’s personality and teaching your child to how to treat technology as one well-regulated element in their daily life. If you don’t want your kid to be a mindless zombie in front of a screen, you can’t mindlessly shove them in front of one. My final tech-policy measure: The iPad and both phones have a security code so the kiddo can’t launch anything on her own. She can—and has—snuck off with the iPad, but since she can’t open anything, it’s a lowly prop in her own open-ended imaginative play, where it’s anything from her clipboard during “animal clinic” to her cookbook when she’s playing chef.